The project draws from the maritime and village-like identity of Laajasalo. 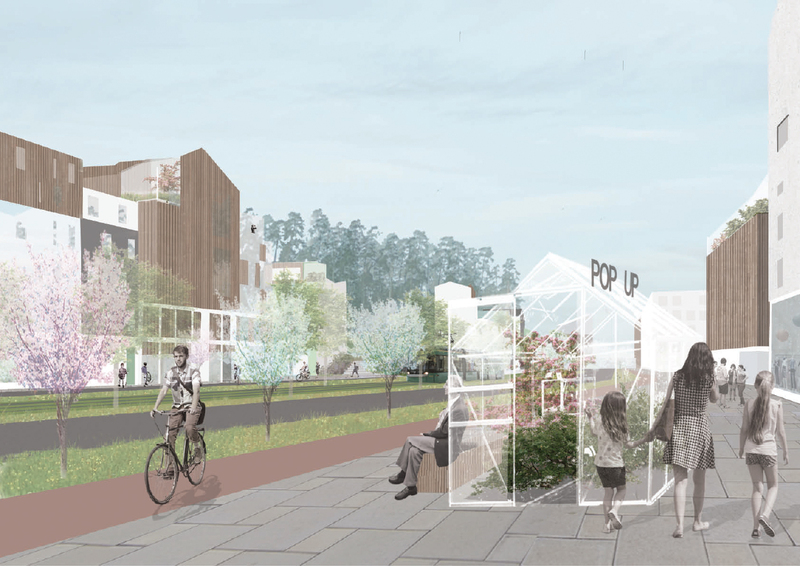 It proposes a productive boulevard and a new urban neighbourhood where local food production is integrated in urban structure in multiple scales. The project envisions Laajasalo to become a pioneer in indoor farming and urban food production. Greenhouses and other facilities on the street level make production visible in the cityscape and thus part of the area’s identity. The farms connect to the surrounding life and economy: local produce is sold in the neighbouring cafes, shops and marketplaces. Cultivation in small scale is also encouraged by providing communal greenhouses and allotments for inhabitants. The North entrance of Laajasalo from Herttoniemi is characterized by the main hub for local food production, at the same time functioning as a landmark for the area. The streetscape on the boulevard searches to reinforce the feeling of a maritime village while maintaining its urban character. Building heights and roofings are altered and the massivity of the housing blocks is broken down with a diversity in the facade relief by cantilever parts and changes in materials. Approaching the Yliskylänlahti area from the Boulevard, building heights gradually become lower. While the color scheme on the boulevard stays light and natural, the maritime blocks are liven up with color. 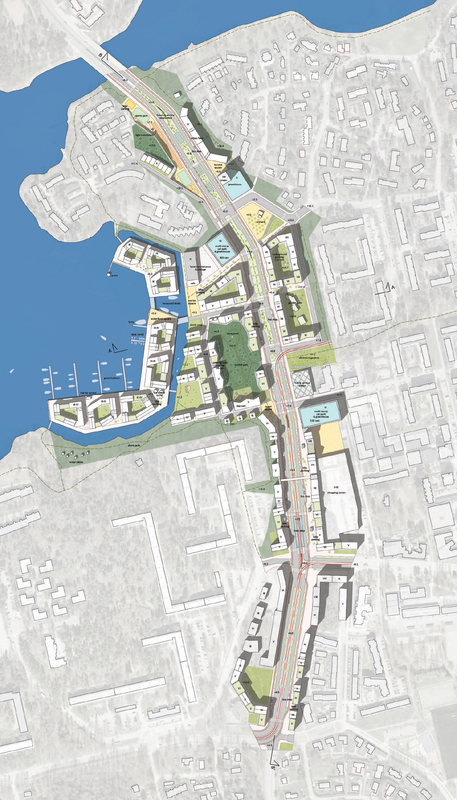 The neighbourhood is formed around a canal, creating a new shore line with land-filled islands but maintaining the presence of the sea also for the blocks on the existing terrain. The project preserves much of the valuable and characteristic nature in the area, providing recreational parks and green views. East-West connections are improved and vistas established from the boulevard to the sea. 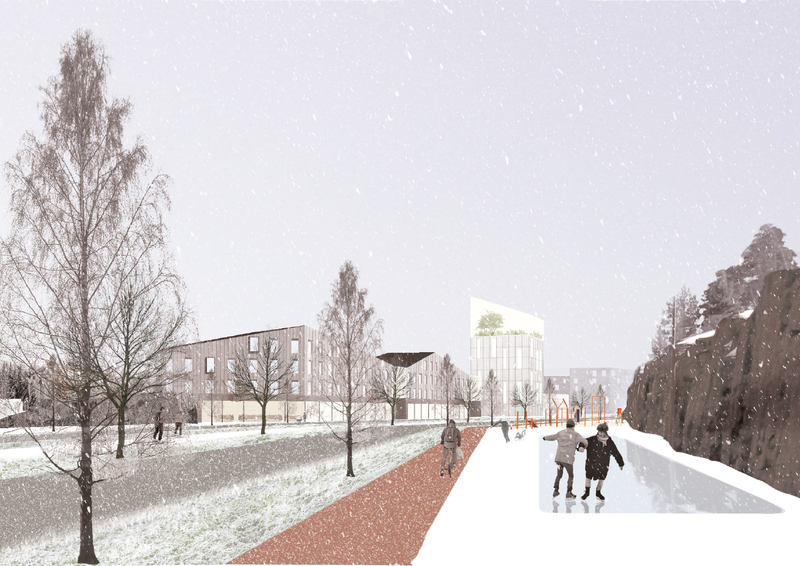 A fluid and versatile mobility network for pedestrians and cyclists is central to the proposal. The development pays attention to biodiversity and ecology. Instead of lawn, much of the green areas along the boulevard are more diverse meadow.The urban runoff management is integrated in the green structure. The runoff is absorbed and detained in in vegetated basins in the boulevard, parks and green roofs. The green areas and vegetation reflect the area’s image as a village producing local food. The plants used in the area are useful plants like fruit trees and berry bushes. In addition to reflecting the image of the area, the berries, herbs and other edible plants can be picked by inhabitants and visitors in the area. Tylsä, “just another neighborhood” tyylinen ratkaisu, johon ei eksyisi muut kuin siellä asuvat. Tässä suunnitelmassa ei ole lainkaan välitetty siitä että paikalliset ja muut Laajasalon luonnonkauneutta ymmärtävät henkilöt arvostavat ja nauttivat Tengerströmin puiston upeasta luonnosta, sen kävelyreiteistä, pienvenesatamasta ja rauhallisesta, hyvinvointia edistävästä metsä kokemuksesta. Tämä suunnitelma pilaa täysin ainutlaatuisen ja luonnonkauniin elinympäristön, mikä Laajasalossa juuri vetoaa ihmisiin, ja tekee siitä niin upean. En ihan jaksa uskoa Laajasaloon lähiruuan kasvattamona? Varsinkaan bulevardin yhteyteen tai lähistöön perustetuilla viljelmillä, edes vitriineissä.. Muutama kymmenen vuotta sitten täällä oli viljelmiä mutta tilanne on todellakin muuttunut ja aikaa ei voida kääntää taaksepäin. Vaikka liikenteen päästöt saataisiin kuriin., katupöly tulle vaivaamaan bulevardin seutua ja ajoteiden varsia, siitä huolimatta. Tengströmin puisto on muuten säästynyt mutta sitä vastapäätä (kapeahkon kanavan taakse) on rakennettu kivitaloblokkeja jotka näkyvät pitkälle metsiin.